Death may be the ultimate end but the persistence of memory demands its reward from the living. 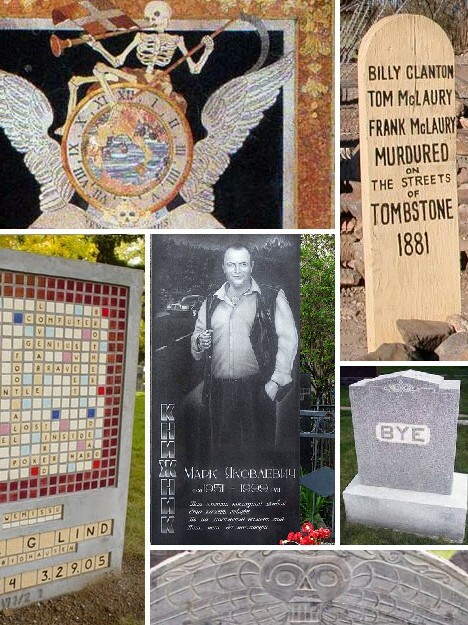 These ten drop dead gorgeous tombstones illustrate exquisitely detail the strength of the spirit to move the living once the dearly departed have themselves moved on. 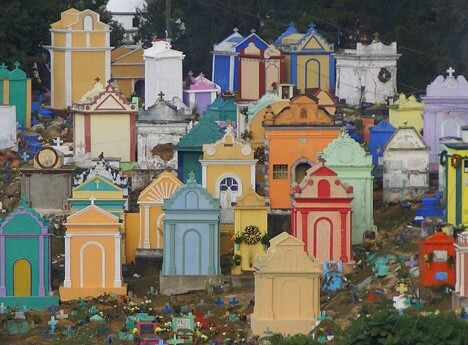 If this isn’t the happiest cemetery in the world, then what is? 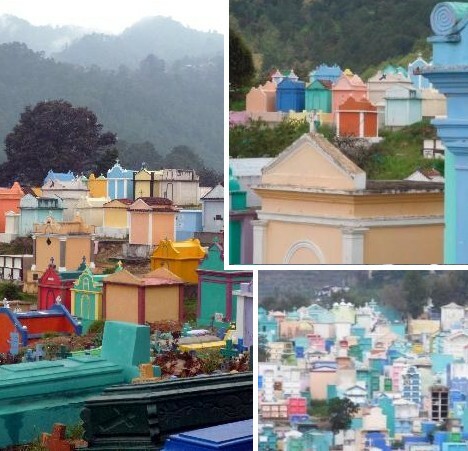 Chichicastenango Cemetery in Guatemala’s western highlands is ablaze with bright colors and whimsical tomb “architecture” more worthy of Disneyland than Zombieland. One imagines visitors to the grave of a lost loved one would have a tough time staying in a somber mood… which perhaps is, in some small way, the intent. The Sovereign Military and Hospitaller Order of St. John of Jerusalem, of Rhodes and of Malta were a tough bunch, and from 1539 to 1798 they lived, loved, fought and died on that storied Mediterranean island due east of Tunisia. 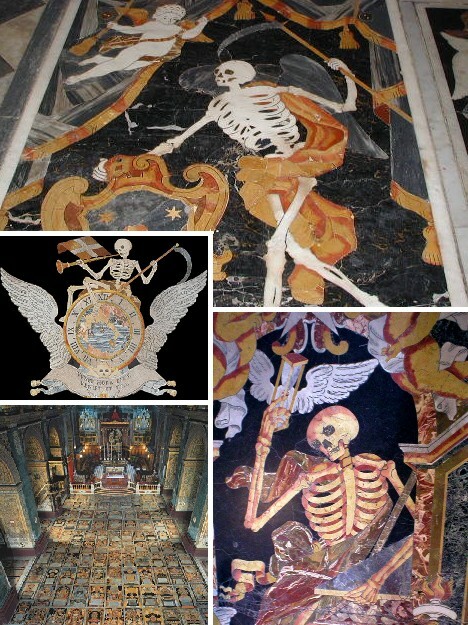 Having withstood a Turkish siege in the 1560s – occasionally using the heads of their prisoners when cannonballs ran short – the Knights Hospitaller’s final wish was to be buried beneath the floor of one of their order’s most holy cathedrals (such as the Co-Cathedral of St. John in Valletta) and memorialized with an inlaid marble tombstone. Often macabre yet undeniably beautiful, hundreds of departed knights await the clarion call of Gabriel’s trumpet on Judgment Day. 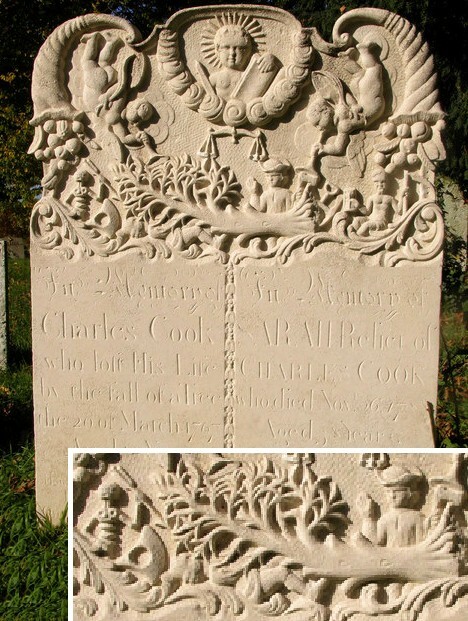 Charles Cook is remembered not for the way he lived, but for the way he died – thanks to his eerily macabre illustrated tombstone. The stone, marked with the date 1767, depicts the unfortunate Cook at the time of his death, killed by a falling tree. Evidently village life in Walberton was a lot slower then it is today; either that or the trees fell alarmingly fast. In any case, Cook’s pictorial gravestone is one of several in the graveyard at St Mary’s Church in Walberton, and one of the more recent stones at that: though modified over the centuries, the church is around 1,000 years old and was mentioned in the Domesday Book of 1086. 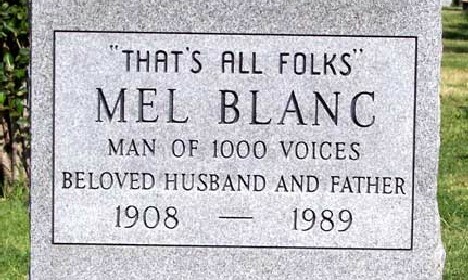 Americans were no slouches when it came to tombstone art either, though the “KISS” (Keep It Simple, Stupid) principle seems to apply. 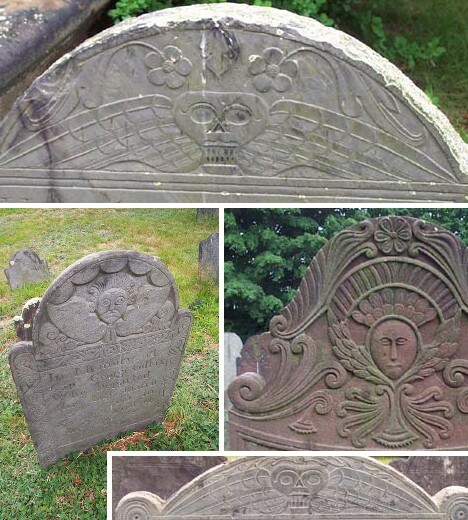 Some of the oldest graves in the nation are in New London’s “Ancientest Cemetery”, and their simple yet expressive carved tombstones have withstood the test of time. One thing you can say about Paul G Lind, he was never at a loss for words. Even in the afterlife. 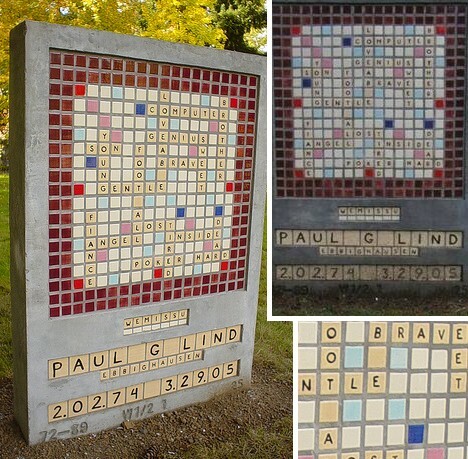 Lind’s finely detailed tombstone stands in Lone Fir Cemetery and commemorates the short life of the dedicated son, brother, fiance and Scrabble fan. We also know Lind was into computers, poker, football and Lost. Scrabble tops the list though – the stone’s designer even went so far as using the two blank pieces. You’d expect to see some strange, odd, even bizarre tombstones at Paris’ Cemetiere de Montparnasse, final resting place for artists and other creative types over the years. 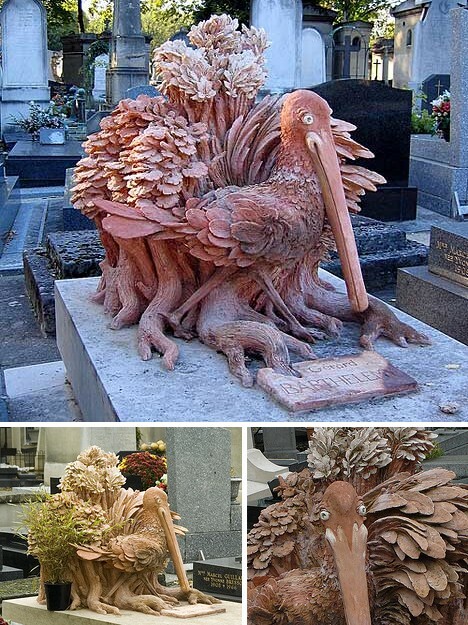 You don’t expect to see a large, reddish bird frozen in stone atop the grave of Gerard Barthelemy, 1938 – 2002. The creature appears to be a Roseate Spoonbill… its connection to Barthelemy is a mystery. Eastern mobsters live, well, somewhat ostentatiously so why should the afterlife be any different? 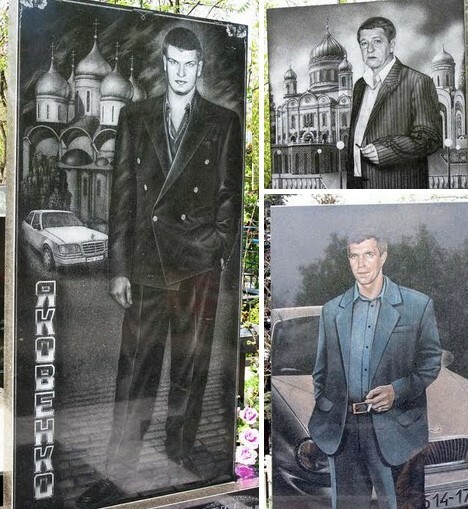 These photo-realistic tombstones are available at select cemeteries in Russia and the Ukraine for between $8,000 and – wait for it – $250,000. It’s interesting to note how many of the gravestones feature Mercedes-Benz automobiles, a dubious form of advertising if there ever was. Also noteworthy is the extreme cleanliness of the markers – no bird wants to swim with the fishes. 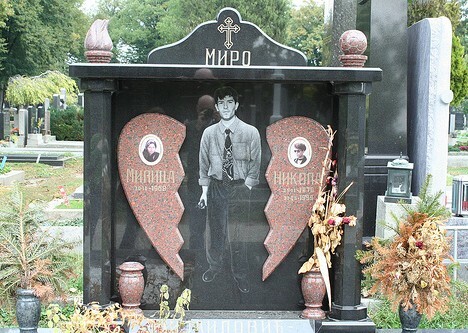 Above is another Russian tombstone of the photo-realistic type. Though it’s not plainly stated whether the person memorialized is a mafioso, one thing’s for certain: he was a real heart-breaker while he lived. Tree trunk tombstones: the other petrified wood. 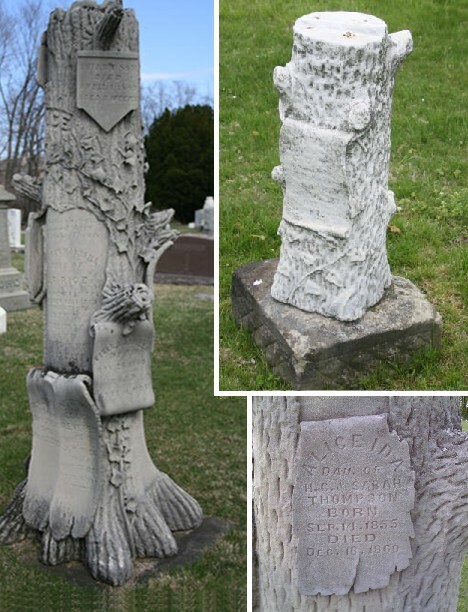 Tombstones shaped like tree trunks shorn of their branches may be unusual but they weren’t all that uncommon in the 19th century. An allusion to the Tree of Life perhaps? Regardless of their symbolism, tree trunk tombstones truly stand out from the ordinary and considering the craftsmanship involved in their production, must have been quite expensive to procure in their day. 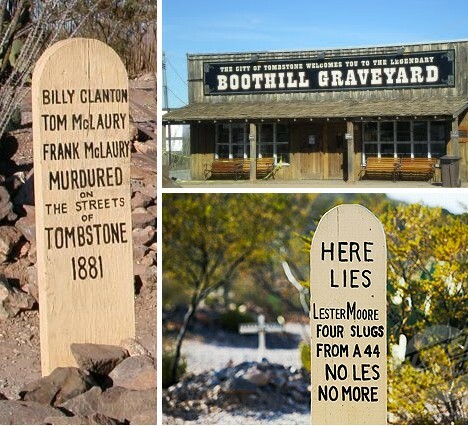 Tombstone, Arizona may have been “the town too tough to die” but that epithet didn’t extend to the Wild West denizens who ended up in Boot Hill Cemetery. Life was hard in those frontier days and death, all too easy. From outlaws to in-laws, anyone who spent enough time in Tombstone ended up spending, well, even more. 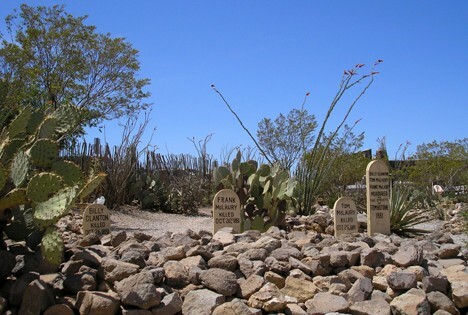 One prominent figure in Old West lore whose greatest fame is in connection with Tombstone, Wyatt Earp, is NOT buried at Boot Hill. Instead, the lawman forever associated with the Gunfight at the O.K. 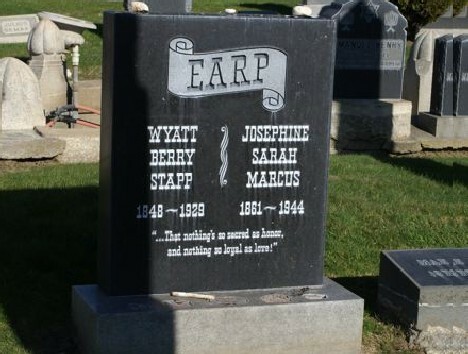 Corral is buried in the Jewish section of the Hills of Eternity Cemetery in Colma, California, alongside his wife of nearly 50 years, Josie Marcus Earp (who was Jewish). 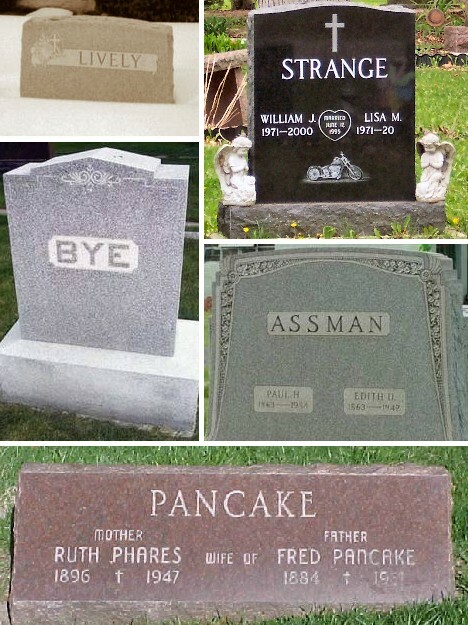 Last but not least, we salute not only those who can laugh at death, but those who can stifle their laughter at inappropriate moments – such as funerals. Just remember: ashes to ashes, dust to dust, you may giggle there now but soon join us you must!